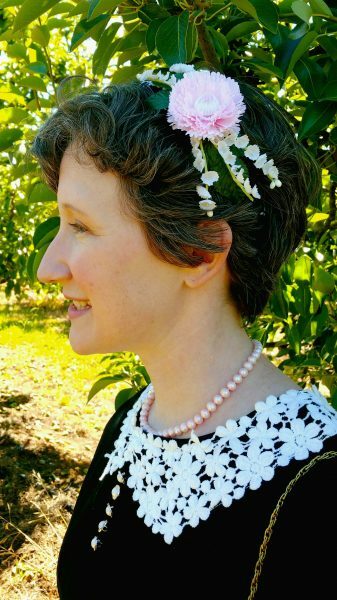 I was inspired by the headband-like “whimsy” hats from the late 1950’s. More hair accessory than hat, these cuties were often built on wire frames and positioned on the head like a headband. 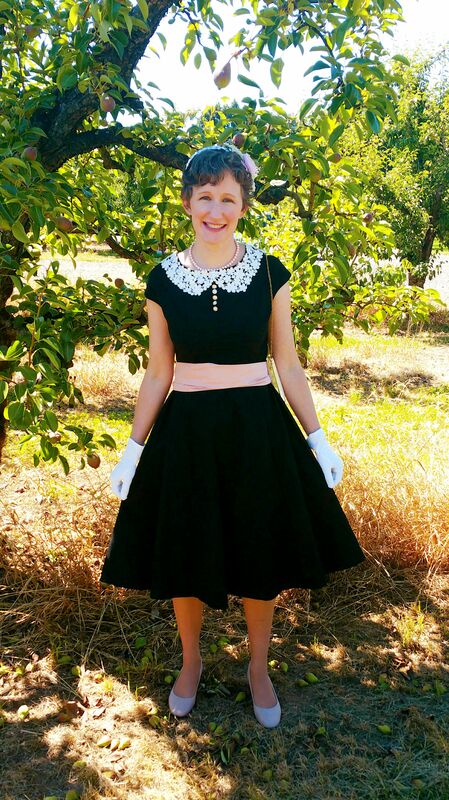 Check out this post, “1950’s Womens Hats” from Vintagedancer.com for inspiration! 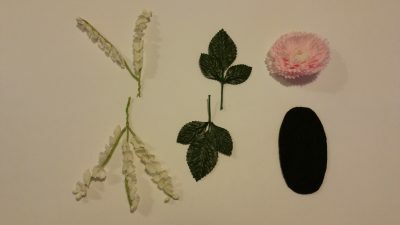 After thoroughly reading that blog post, I gathered my supplies: a headband, vintage scarf, lace, and silk flowers. I also had a needle and thread, glue gun, and felt remnant at the ready. 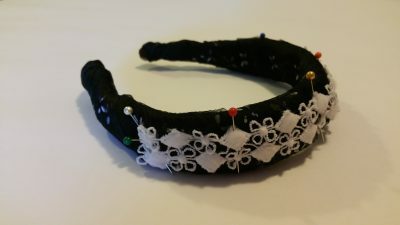 My goal was to cover the headband with the scarf and then decorate the headband with the lace and flowers. I began by folding the scarf into a thin roll and then tying the scarf to one end of the headband. Next, I began wrapping the scarf around the headband. In retrospect, I could have wrapped the scarf looser to create more volume around the headband. I knotted the end of the scarf at the other side of the headband. With help from a needle and thread, I tucked the ends of the scarf around the ends of the headband and stitched them in place. 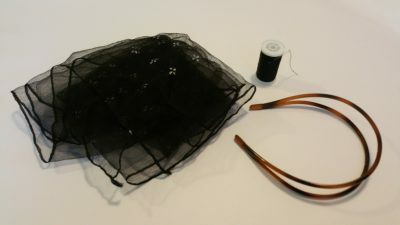 I also made small stitches around the crown of the headband to insure that the scarf didn’t slip. Next, it was time to decorate! I experimented with placement options for the lace before pinning and stitching that in place. After removing the plastic base, I unstacked the petals in size order and removed the center stem. 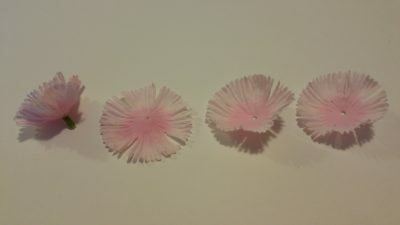 I then glued the petals back together, layer by layer, using hot glue. 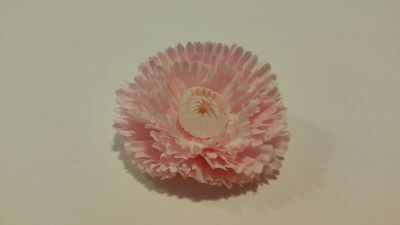 The resulting flower had shape but much less stiffness. 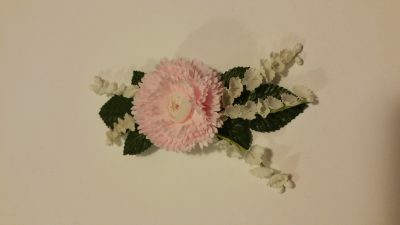 I cut out an oval-shaped piece of felt that would become the base for my flower arrangement. 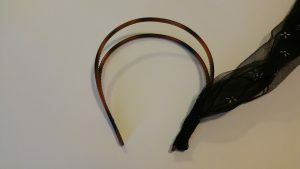 The width of the oval was slightly less than the width of my wrapped headband. I experimented with placement for the foliage before glueing the pieces down in layers. 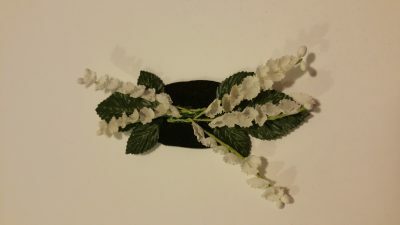 I loved how the stems of white flowers and the two leaves had wire stems! This allowed me to shape them as needed! 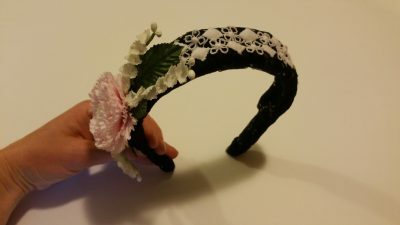 Finally, it was time to stitch the felt base of the flower arrangement onto the headband! I was pretty pleased with how well my “Whimsey” hat turned out! In fact, I am tempted to make more, after seeing how simple it is to make a hat that perfectly matches an outfit! I would love to try this with other vintage scarves and perhaps brooches and/or feathers! The hat perfectly coordinated with my mostly-thrifted outfit! I felt fabulous at our friends’ wedding celebration! I couldn’t help taking copious photos in the orchards overlooking Mt Hood in Oregon! I also couldn’t help taking a twirl. What day! What a place! !